Maybe it’s the endless days of sunshine or the iconic desert landscape that brings you to the Valley of the Sun, but one thing is certain—you can unlock the best rates with Marriott. Book that long-awaited weekend you’ve been dreaming of today. 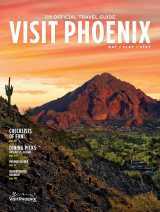 Booking Instructions: Book your stay at https://hotel-deals.marriott.com/arizona-phoenix/. Be sure that promotional code M96 appears in the Corporate/Promotional code box when making your online reservation, or call 1-800-228-9290 in the US and ask for promotional code M96.